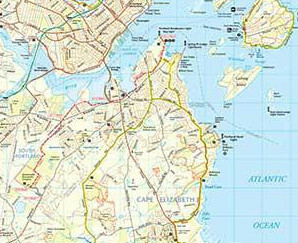 Cumberland was once a part of North Yarmouth, but became its own town in 1821. The town has a total area of 26.25 square miles, of which 22.88 square miles of it is open land. The population is at 7,200. Cumberland is a Portland suburb that has a rich farming history, but only a small number of working farms remain, such as Sweetser's Apple Barrel and Orchards, Spring Brook Farms, and Double T Orchards. Near the center of the town, there is recreational facility call Twin Brook, which covers over 250 acres. This is run and maintained by the town. There are over 22 acres of mixed athletic fields, baseball and softball fields, soccer fields, restroom facilities and more than 4 miles of wooded walking trails. The facility is open to cross-country skiers, walkers and sports practices. In the winter months, many trails are maintained and groomed by the town. It is used sun up to sun down by a wide age range of people. Cumberland had a few small businesses, some of which are on Route 26, also called Gray Road. Don't forget to check out the Cumberland Fair, which is one of the state's largest agricultural fairs and has been held yearly at the end of September since 1868. Listing courtesy of Fontaine Family-The Real Estate Leader. Listing courtesy of RE/MAX Shoreline.